2xDGames 7Games Compilation - A collection of 7 games from the domestic Developer 2xDGames. The collection includes the following games: Bazket, Bazket2, Detris, Greenhead, Lolbob, MagicBag and The Highest Tower. ___________________________________________________________________________ As you drive Bazket basket, you will need to collect all objects you encounter, or you lose the game. In Bazket2 you will also manage a basket. In this version, the objects are falling, also must be collected to continue. Bazket2 includes dual-player mode. Detris - An interesting take on the legendary game Tetris. Lots of modes to choose from. Greenhead - An arcade game, where you have to dodge the boxes and balls coming at you, collecting bonuses along the way. In Lolbobe, you're operating a Lolboba. Your goal is to survive as long as possible in the game without affecting kvadromonstrov, and scoring as many points as you can while collecting all sorts of diamonds on the playing field. Magic Bag spits out many different things. 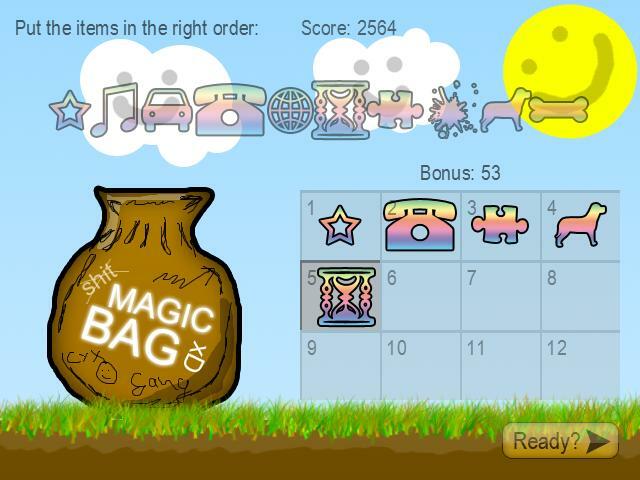 Your task is to sort the items in the order in which they flew out of the bag. The Highest Tower - A fun arcade game in which the goal is to build a tower of cubes as high as possible and break the world record! Stack the blocks on top of each other so that they do not topple. ___________________________________________________________________________ Do not forget to enter your high scores online! Good luck!